Tim Webber, Chairman and Managing Director of Barnfield, Tracy Clavell-Bate, Head of Developments and Acquisitions at Barnfield, Denise Park, Deputy Chief Executive at Blackburn with Darwen Council, Charlotte Pickup, Marketing Manager at Barnfield, Councillor Phil Riley, Executive Member for Regeneration. The demolition will make space for a business park creating jobs for the local area together with new housing. An outline planning application detailing these plans will be submitted in November. 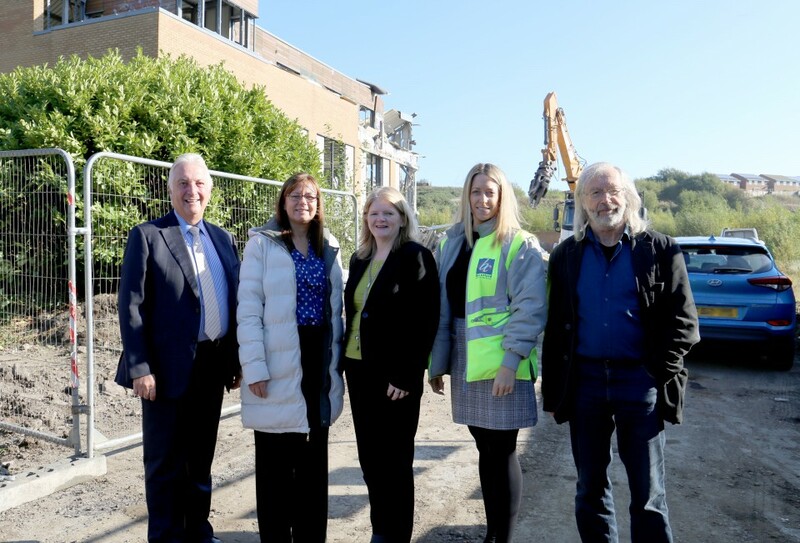 The redevelopment project is a joint venture partnership between Blackburn with Darwen Council and Barnfield Construction. The site was formerly home to the Lower Darwen Paper Mill before its demolition and currently has two derelict office buildings which front Greenbank Terrace. This site has been out of use for years for various reasons so it is a really positive move to see work starting and it really is a fantastic location.